ITA (Intelligent Tipping Assistant) is an onboard system that improves safety during tipping, giving the operator visual and audio alerts through a tablet or a smartphone in the cabin. The high-tech Binotto telescopic cylinder is the basis of ITA. Through its high accuracy sensors and integrated processing unit, ITA monitors the main critical factors for the safety and the stability of tipping vehicles before and throughout the whole tipping operation. At any time, the system detects useful information concerning the body status and the vehicle inclinations (‘pitch’ and ‘roll’) and promptly warns the operator when values exceed the safety limits set by the manufacturer. A tablet (or an integrated monitor) is located in the cabin of each vehicle equipped with ITA. 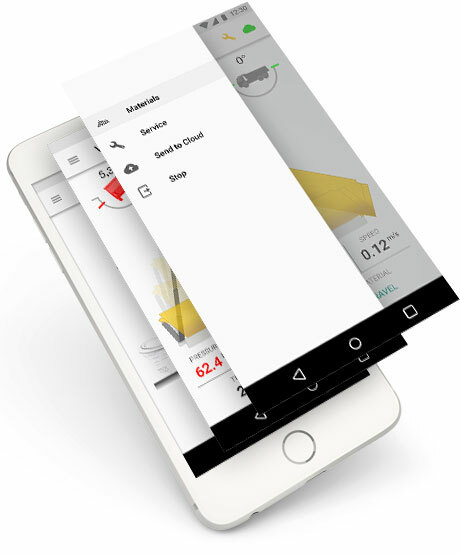 The dedicated App running on the tablet displays the data processed by the ITA black-box installed in the vehicle with a simple and intuitive layout for a quick understanding. User friendly graphic design has been developed to ensure a quick and easy interaction with ITA, allowing prompt risk detection to prevent damages. 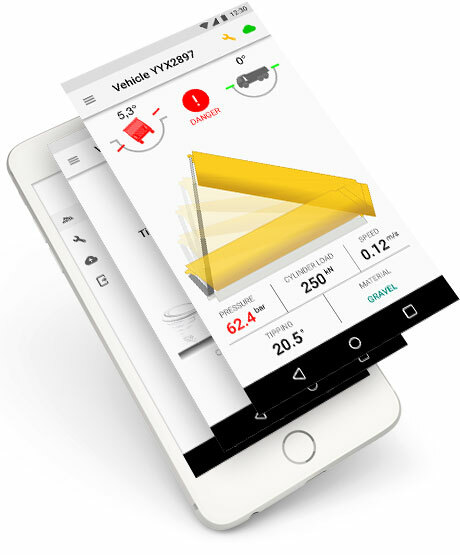 The tablet works as a dashboard: in the middle of the screen a 3D image shows the real-time tipping inclination of the body. Other dashboard indicators provide information about the vehicle stability: pitch (front-rear inclination) and roll (side inclination). They show the real-time updated status of the vehicle before and throughout the whole tipping and lowering operation. All values are in green colour when the vehicle is working in safe conditions. In case the colour of one or more values turns red, the vehicle is exposed to danger. At the same time an audio alert also warns the operator of the risk. The alerts stop once the vehicle is operating again within the set safety limits. 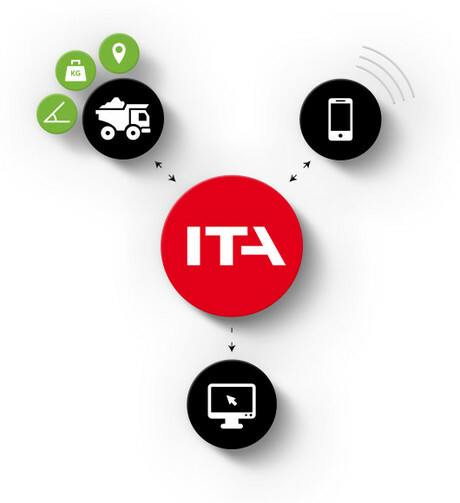 ITA is both a useful system for the operator to monitor the vehicle performances and conditions and an accurate source of information for remote monitoring and control. The data of every single operation (including those exceeding the safety limits) are recorded and sent to the server. dangerous operation can be reviewed in order to prevent non-compliant behaviors and improve efficiency and quality of work. ITA is a versatile system suitable for any type of vehicle and tipping body, whether it be a tipping truck or a semitrailer: in all vehicles featuring an ITA system the ITA black box is preset according to the data of the related tipping body. 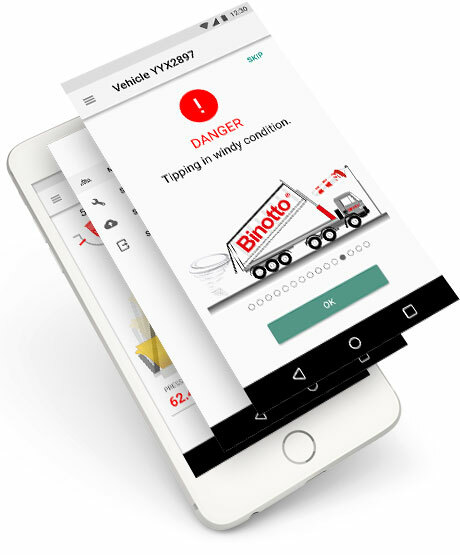 In case ITA is installed on a semitrailer, the operator will just indicate in the App time by time which prime mover he is going to use for it and the related data will be recorded in the black box.